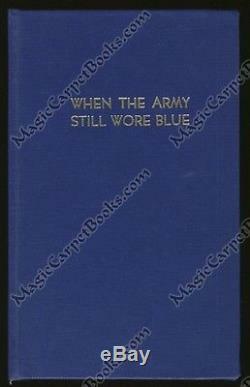 When the Army Still Wore Blue: The Military Life and Times of General Ezra P. Keywords: History, Biography, Ezra P. Ewers, Brigadier General, Civil War, Battle of Chickamauga, Indian Wars,ish-American War, New York, Wayneport, Wayne County. Edition limited to 150 copies. Iv, 146, x, 17 pages. No dust jacket, as issued. Inscribed to author Charles Convis and signed by the author. Order Form and handwritten note from the author laid in. All items subject to prior sale. AN - As New F - Fine VG - Very Good G - Good Fair - Fair P - Poor. AN/F = As New book in a Fine dust jacket. The item "WHEN THE ARMY STILL WORE BLUE General Ezra P Ewers CIVIL WAR Indian Wars NY" is in sale since Monday, January 2, 2017. This item is in the category "Books\Antiquarian & Collectible". The seller is "magiccarpetbooks" and is located in Carson City, Nevada. This item can be shipped worldwide.